The San Jose Blog: Welcome to 2016 San Jose! Welcome to 2016 San Jose! Happy New Year everyone! 2015 was a phenomenal year for San Jose and I'm optimistic that 2016 is going to be even better. Here is a look back on how we did on 2015 predictions as well as a look to the future. 2nd Generation Residential High-Rises - It has been a long time since a high-rise residential project opened up in San Jose. This year both One South and Centerra will start leasing and will bring a thousand new residents to our city's urban core. Success. One South has filled up nicely and Centerra has just started leasing. Both of these should be completely full in early 2016. Half-a-Dozen More Cranes Downtown - 2014 is the first year I can remember since the early 2000s where we had three cranes in the air Downtown. 2015 will have many more. 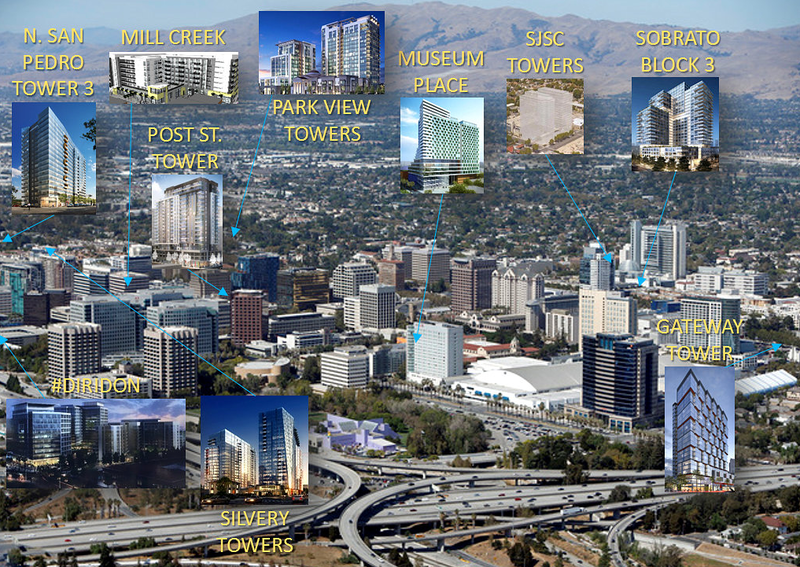 Silvery Towers, the AC Hotel, Marshall Squares, the Post & San Pedro Tower, Park View Towers, Symphony Towers, and Mill Creek are all expected to start construction this year. We get partial credit for this one. Silvery Towers, the AC Hotel, and Symphony Towers are all well under construction. Marshall Squares and Mill Creek will definitely get going this year. The rest are still up in the air but have good chances along with new 2015 proposals for the North San Pedro Tower, Museum Place, SJSC Towers, Sobrato Block 3, the Greyhound Towers, and #Diridon. 2016 could have more cranes than at any other time in San Jose's history. Retail and Office will Thrive Downtown - We are finally building enough critical mass Downtown to make retail succeed, and just about every project mentioned above will have a retail component to help fill gaps between retail centers. Office vacancies will likely fall below 10% as more tech startups realize what a great value and experience Downtown San Jose provides. Fail. Office vacancies did not fall below 10% and we still have key retail gaps, but this is one I'm still optimistic we can hit in 2016. Stadiums Galore - Last year we have the grand opening of Levi's Stadium, which is bringing multiple world-class events a stones-throw away from North San Jose. Our hotels, restaurants, and entertainment facilities are also benefactors here. The new Earthquakes Stadium also goes live in 2015, bringing even more events and quality professional sports to San Jose (along with the largest outdoor bar in North America). Success. Avaya Stadium and Levi's Stadium have both proven to be enormously beneficial and boosted our local economy. 2016 will bring the Super Bowl to Silicon Valley and San Jose is already shaping up to be a key benefactor from the event. More Great Restaurants - Last year we got First to Market, Taurinus Brazilian Steakhouse, Spuds, Garlic Bread, Seven Seas Sushi, Nick the Greek, and a lot of other great places. 2015 is going to be the year of the Urban Markets with the SoFA Market realizing its potential and a new Market going up by SJSU. Success. The restaurant scene blossomed in 2015 with major additions such as Lou's Beach Shack, Konjoe-Tei, Hawaiian Poke Bowl, Deluxe, Voltaire, Aura, HOM. The SoFA Market is nearly full, and the new SJSU market should be ready by the end of 2016. With Centerra nearly complete and Silvery Towers under construction, the amount of eateries in the San Pedro Square Market area should double by 2017. We also have some great additions slated for 2016 such as Sushi Confidential, Uproar Brewery, and Social Policy. More flights at SJC - We got Tokyo in 2013 and we're about due for at least one new international route this year. You can also expect more routes and flights and the economy continues to thrive. Success. We could not have nailed this any better! Instead of closing one new international route, we are getting four! San Jose will have direct flights to Beijing, London, Frankfurt, and Vancouver in 2016. Seoul and Shanghai are rumored to be in the works as well. BRT Launches - We will have our first Bus Rapid Transit (BRT) line this year, which will run between Downtown and Eastridge. BRT combines the convenience of Light Rail with low construction costs, and may be key to dramatically improving public transit in the short term. More BRT lines and the BART extension area also on their way. Fail. The Alum Rock BRT line was delayed by a whole year and the construction caused a lot of damage to the community. Hopefully we will get this one back on track. The Completion of Santana Row - The last major development projects to complete the original vision for Santana Row should be under construction this year. Not to worry, Federal Realty will soon start working on a brand new project across next to the Winchester Mystery House. Success. Santana Row construction is in full swing. An entire building has been leased to Splunk, and there are plans to build a major office campus across the street. That's a wrap, hope you all have an amazing first day of 2016! 6 out of 8 is not too shabby!